Say I give you two puzzle pieces with shapes on them that look a little like tetriminos. I tell you to turn them into a square of a single color, but there aren’t enough pieces, and they’re in the wrong orientation. And beside all of that, one’s red and one’s blue. 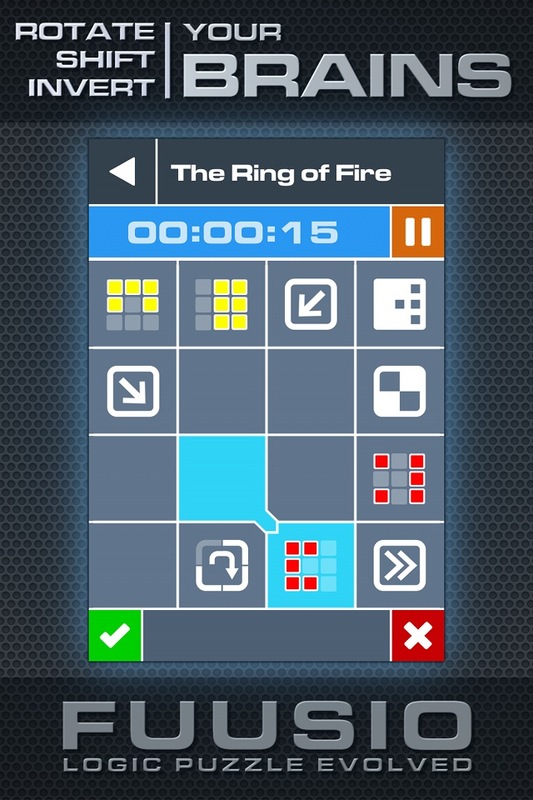 That’s the type of problem Fuusio ($0.99) places in front of you in each of its 160 levels. Everything you need to do with your shapes can be done, you just need the right operator blocks. The right ones are there in every puzzle, laid out for you on a grid – all you need to do is figure out how on earth they’re supposed to solve your problem. The game’s big trick is this: each piece can only affect an adjacent space on the game’s grid. They can’t move, they can only interact or fuse with another piece. This immediately narrows the approaches you can take to solving each puzzle, especially when you move beyond 3×3 level grids. Fuusio is a game of logic and process flow. What pieces will you need to create a square? How can you manipulate them to make them fuse with each other? And in what order do you need to complete those steps for it to all come together in the end? Fuusio boasts a stunning variety of levels. With such a substantial toolbox, the developers were able to put together 160 levels that rarely feel like they’re repeating themselves. In one level you might take a shape, rotate it, recolor it, combine it with another, shift their parts to the left and then reverse the whole works before you can finish a single square. In another you’ll have to complete a maze of pieces that need to be combined in just the right order if the whole thing isn’t going to fall apart. There are no hints in Fuusio, but there are also no restrictions. If you’re stuck in a level, undo your last moves or start fresh. Or just leave it alone. Since the levels can be completed in any order, you can always pop out at any moment, try something else and come back refreshed. 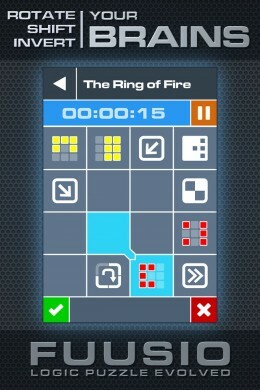 Like some of the great logic puzzles, this is a game that allows you to devote your attention to just one puzzle and feel rewarded when you finally discover the answer. Given enough time and focus you could certainly learn Fuusio inside and out, but the game doesn’t give it up easily. You have to work for your scores here, and the work can be hard going. I love that Fuusio doesn’t shy away from complexity, that behind its stark, minimalistic exterior lies a mess of tools and techniques that can be combined and recombined to create ever-greater challenges. Every day we see games that pander and require as little of us as possible; it’s always a relief to play one that’s willing to ask for more.